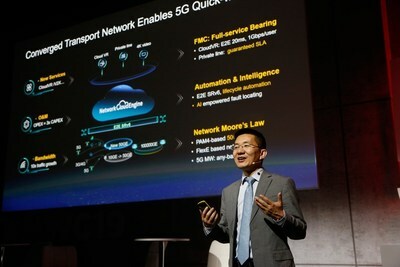 BARCELONA, Spain, Feb. 25, 2019 /PRNewswire/ — At MWC 2019, Huawei launched the 5G-ready converged transport network solution. This solution will help build a transport network that supports all services, helping operators jump start 5G development through simplified 5G transport and fast deployment. So far, Huawei has won over 40 commercial 5G transport contracts. GSMA predicts that by 2025, there will be 1.3 billion 5G users and 1.36 billion 5G mobile devices around the world, with 40% 5G network coverage. To build 5G networks, transport networks should get prepared in advance. 5G networks have three major use cases, bringing 10x higher network bandwidth, 10x more complexity in network operations & maintenance (O&M), and 100x more connections. These are the core challenges that operators will face when building 5G transport networks of the future. During this process, operators will need to consider the future-proof evolution capabilities of their transport networks. To meet operator needs, Huawei launched the 5G-ready converged transport network solution, enabling global operators to maximize their business value by offering three core capabilities. The 5G-ready converged transport network solution was built upon the industry’s first 50GE router and 5G microwave solution based on the four-level pulse amplitude modulation (PAM4). This results in 10 Gbps to sites and 30% lower total cost of operation (TCO). For fiber access scenarios, the router supports two-way single-fiber transmission, reducing cost per bit by 30% and fiber resources required by 50%. For scenarios without fiber access, Huawei’s 5G microwave solution can deliver 10 Gbps bandwidth access over any frequency band. It also offers flexible channel expansion capabilities, so that only one site visit is needed for service provisioning, reducing operator TCO by 30%. The 5G-ready converged transport network solution uses the industry’s first commercially-ready SR and SRv6 solution, enabling smooth evolution from MPLS to SR and SRv6 protocols, with no interference between 4G and 5G services. Huawei’s 5G transport solution supports both MPLS and SR protocols, so that operators can use the SR and SRv6 protocols for deploying end-to-end 5G services while simultaneously using the MPLS protocol for 4G services. This means new services can be deployed while ensuring the continuity of older services. Built on the network processor (NP) programmable architecture, the SR and SRv6 solution supports smooth evolution from MPLS to SR and then to SRv6 without any changes to the hardware. The industry’s first Network Cloud Engine (NCE) integrates network control, management, and analysis, allowing the 5G-ready converged transport network solution to support full-lifecycle automated O&M across the entire transport network. Huawei’s NCE supports the unified control and management of 4G and 5G transport networks, and provides a machine-machine interface that is driven by models, instead of a human-machine interface. This reduces the time required for service provisioning from hours to minutes. And the telemetry and AI technologies mean it takes minutes, rather than hours, to complete fault demarcation. The NCE also possesses big data analytics capabilities that enable visualized service level agreements (SLAs) and targeted transport network expansion and optimization. Huawei has remained at the top of the global mobile transport market for seven consecutive years, leading the development of the mobile transport industry. It has also helped leading global operators build over 40 5G transport networks. Huawei plays an active role in international standards organizations such as the Internet Engineering Task Force (IETF), ITU Telecommunication Standardization Sector (ITU-T), and European Telecommunications Standards Institute (ETSI). It is a key contributor to 50GE and SRv6, and is a leader of 5G microwave and intelligent networks.